I love the Vangaurd Novels and Love Cervantes Quinn's character. I've had an itch lately to make the S.S. Rocinante in 144 scale and think I've cracked the code. Here's a Photoshop comp of what I would like it to look like in the end. The extra Cargo Pods and cockpit will be sheet styrene. I plan to build the cockpit interior as well. 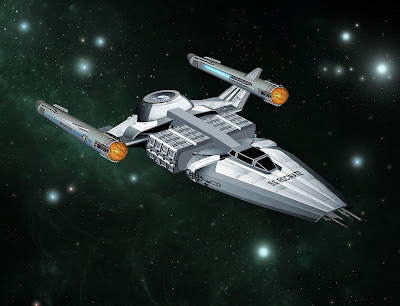 I will be purchasing nacelle modification bits from JT Graphics to make the nacelles look unique.